RAJAGIRIYA – After 12-14 hour work days and slowing down a few months ago, Sri Lanka’s iconic Mr. Pure Ceylon Tea plans to take a much-needed break this year – visit numerous friends overseas and devote more time to his twin passions: engaging with plantation workers and hundreds of differently abled children. 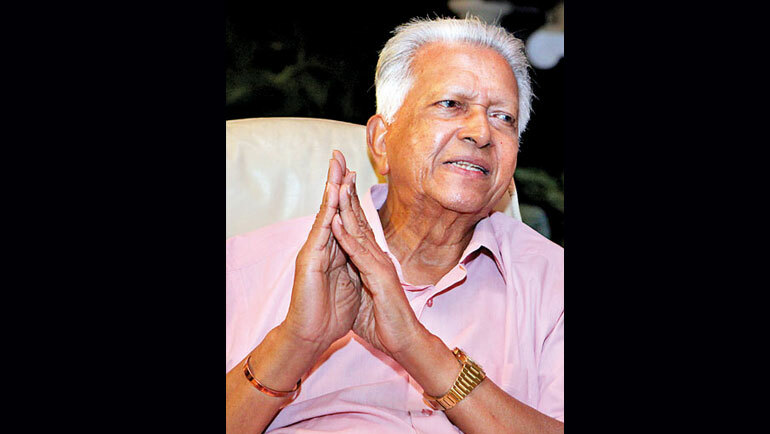 While Dilmah, the path-breaking Ceylon Tea brand marks 30 years in the business this year, its founder Merrill J. Fernando, going into his 88th year on earth, says he has many personal things to do; many plans to keep. Sitting down for a relaxed conversation at his sprawling residence at Buthgamuwa road at Rajagiriya, the tea veteran, whose face on the cover of every Dilmah tea pack is synonymous with Pure Ceylon Tea, is buzzing with ideas and things to do. But on this cool, late December evening, we are not talking business. It’s all about personal goals, achievements and the future, the last bit of which extremely excites him. Many of them have told him, “Please come and stay with us at our farm or in our vineyard”. While Merrill’s rise to fame through the Dilmah brand is legendary, well known and profiled many times over, here and abroad, the hard work in creating and building the brand has had its toll on the body. Up to about three years ago, his work day began at 5 am at home, going to office and returning at 10 pm. Then he slowed down. “About three months ago I was feeling very stressed and unhappy, that I could not divest myself of the various responsibilities and free myself and give my body and my mind, my whole system a break and go on holiday wherever I want and so forth. It was at this point that I came to terms with this crisis. Now I have succeeded largely in divesting the responsibilities not only to my two sons but also divesting to my senior staff so that the strain and stress on my two sons will be nowhere like what I went through,” he said, shaking his head in a “never again” gesture. Then he laughs and veers back to the conversation on life saying what a great time he had about 8-10 years ago with friends, going dancing and on picnics and holidays in Yala and Wilpattu until work got the better of his social life. In the next few months, he plans to go to office only 2-4 times a week and that too, a reduced work day. Merrill’s mind is as alert as a 25-year old, recalling the last time – five years ago when we met, pointing to some chairs in the other part of the large verandah of the sprawling bungalow complex. “We sat there and talked,” he said, reflecting on the August 2013 interview. Thirty years after Dilmah was launched, the brand is selling in 100 countries while its new, successful tea lounges will probably reach close to 100 this year, from a current 25 +, in several countries. Recent ones opened included, Iran, Dubai and Spain in a marketing initiative that no other tea brand in the world has ventured into. “Oh yes, last year in particular was strenuous. I must have done 25 foreign trips short and long ones. We cover several markets in a trip and this travel has increased because of opening Dilmah tea lounges,” the Dilmah founder says. Merrill wants to travel less this year and spend more time with hundreds of children, some differently abled and the others who need a helping hand in education or whatever they like to do, through the MJF Foundation. “I have committed myself to not travelling in January and February except Brunei,” he said during the December 2017 interview. On January 19 he is scheduled to go to Brunei for the formal opening of the Dilmah Tea lounge. However he seems serious this time and his annual year-end company review will find him saying that he wants to take things easy and do the things, he would like to do but not been able to, at least give more time to his passion and interests. Without a doubt, what he loves most is spending time with the children at the MJF Centre for Dignified and Sustainable Empowerment at Moratuwa and other places for children run by MJF. The piece de resistance of the Moratuwa centre is their annual Christmas event titled “Celebrating Differences”, this time held on December 10, 2017. The event brought together 250 children from MJF centres in Moratuwa, Pallansena and Peliyagoda, the NCCCPDD (National Cerebral Palsy Centre) at Rajagiriya, School of Inspiration in Koul Ara and Sithijaya in Ambalantota and from Cape Weligama. This annual event brings together children with Down Syndrome, Autism, Cerebral Palsy and other developmental disorders and their mainstream peers and youth from under privileged communities in celebrating differences that brings tremendous joy to all these children. He plans to spend every Saturday at the Moratuwa centre, an extension of his philosophy that ‘business is a matter of human service’. Essentially strong-willed in character, however at a ‘celebrating differences’ event at Moratuwa when he rose to speak he choked back tears after seeing the children – who according to the organisers spend the whole year rehearsing for this look-forward to event – perform happily and enjoying despite their disabilities. “I look at them and think why has God made me healthy and not them,” he said. Wealth, he believes, is of no use if you don’t share it. ‘When you make your final journey people must say that this man helped us and showed that wealth is a good word, not a bad word. Not people saying: ‘This man was a rotter. He amassed wealth, gave it to his children and they busted it up,” Merrill signs off, just as his aide says dinner is ready. Photographer Amila and I join Merril at the dining table and we tuck into a nice Sri Lanka dinner with string hoppers, egg curry, fish, parrippu, etc winding up with some curd and treacle. At one point, Merrill looks up and nods, smilingly, probably remembering the last interview which also ended on a similar, stomach-filled adventure. Merrill J. Fernando talks to Feizal Samath on various facets of his life, slowing down from a hectic work-day and enjoying everyday food and an occasional sweet. “I ate two pieces of cake, today while chatting with another visitor. He was a bit horrified but I said aren’t the medication that I take meant to help you eat whatever you want,” he laughs. From the beginning I have been interested in the workers and their welfare. People know me for tea. But I get far more satisfaction in helping the poor, the ill, the disabled and the needy. I spend a lot of time and money through my foundation since I too started from nothing. All my companies are doing well and donate 10 per cent of their pre-tax profits to the MFJ Charitable Foundation. The industry has not changed one bit. That’s because there are no visionaries in the plantation industry. Everybody has written off tea and rubber. I have a lot of faith in tea and love the industry from the time I spent my school holidays in Pundaluoya with close friends. Whenever I speak on Ceylon Tea I say I am only the postman, the messenger giving the right quality at the right price. Like any entrepreneur you come to the crossroads – become a multimillionaire and/or share your success with others. I took the road of sharing my success and now I have both – wealth and helping others. Throughout God has been my friend when many people turned against me. I used to go to All Saints Church and pray many times during those hard times. What is happening to the values and discipline today? In today’s families, the father and mother are both working and the children are neglected. That sense of belonging, belonging to the family has disappeared. The advancement of technology has contributed to the decline in values. Mobile phones have become a source of distraction, no values. I can’t believe my eyes the way children behave today. I urge parents to spend 2 -3 times a week sitting down with your children eating together, talking. I tell my friends that the best investment for your children is your time; not material things, if you don’t give them your time, they won’t give you their time.